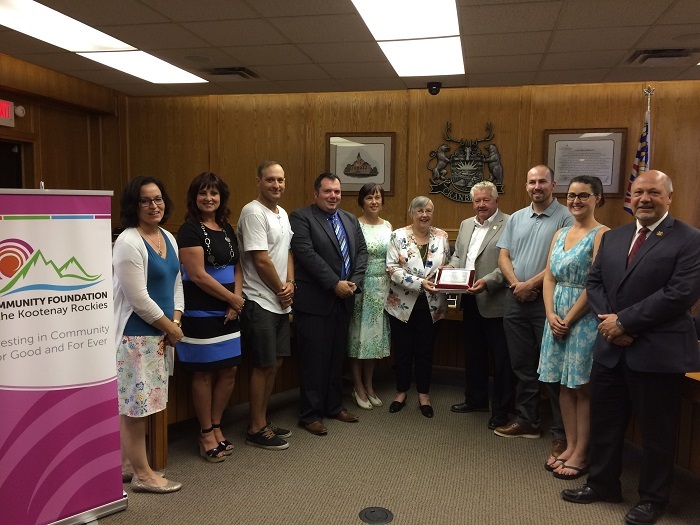 Cranbrook, BC (July 16, 2018) – Jean-Ann Debreceni has been awarded the 2017 Sustainable Community Builder of the Year Award at the regular meeting of Cranbrook City Council Monday. Jean-Ann has been involved for the past 21 years with the Board of Directors of the East Kootenay Community Credit Union in a variety of capacities. She is proud of her community, along with the variety of activities and cultures it embraces. She not only has a strong passion for community theatre and the performing arts -- working tirelessly to see it sustained in Cranbrook, but has been a member of the Cranbrook Garden Club, and worked with Fort Steele Heritage Town and the Key City Theatre. The annual award is given to an individual, group, club, agency or society that has contributed to the social, arts/cultural, economic and/or environmental sustainability of Cranbrook. It includes $500 to be donated to a registered charity of Debreceni’s choice. She is choosing to donate the funds to the Cranbrook Community Theatre’s endowment fund through the Community Foundation of the Kootenay Rockies (CFKR). The $500 in funding for the Sustainable Community Builder Award comes from the legacy fund left to the Community Foundation of the Kootenay Rockies (CFKR) by the Knights of Pythias, Crescent Lodge #33 of Cranbrook.